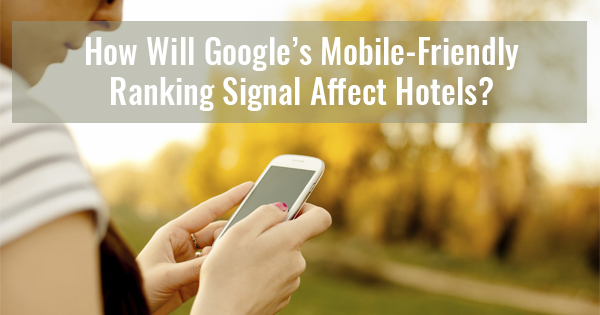 How Will Google’s Mobile-Friendly Ranking Signal Affect Hotels? 94% of smartphone users search for local information and 84% of those users take action – including calling the business or purchasing a good/service.1 A fun fact, 77% of mobile searches actually happen while the user is at home2 – where a desktop computer is more than likely to be available. With the continuous rise of mobile use for search, it’s evident that having a mobile-friendly site is important for the success of your hotel’s business. Now imagine this, if users look at your site using their mobile devices, will they be able to easily navigate through your site, find the information they needed, and take an action such as book a room? Or will it be hard to use? If your hotel has a non-responsive site that is optimized only for desktops, mobile users would need to pinch or zoom to see the content more clearly on a small screen. This can be very frustrating, and you have more than likely experienced the same frustration yourself. This exact frustration is what Google is trying to eliminate with their recent mobile-friendliness ranking signal. According to Google, as of April 21, they will roll out this update to their algorithm worldwide, giving praises to sites optimized for mobile with “mobile-friendly” labels and higher ranking/visibility in mobile search results.3 On the other hand, non-mobile-friendly sites will be penalized with user warnings of site’s faulty re-directs and also rank lower than competing sites that are mobile-friendly. Architecture: Think of your customers and how to make it easy for them to navigate through your hotel’s website and find the information they need. Make it easy for website visitors to take actions that meet your business goals – email sign up, book a room, social share. Speed: research shows that users start dropping off a site if it hasn’t loaded within 4 seconds. There’s nothing more frustrating than looking at a desktop site on a mobile device, other than trying to access a slow-loading site on a mobile device. Local Search: as most mobile searches are local in nature, ensuring your hotel information is accurate and consistent throughout the local ecosystem is critical to your hotel’s mobile search success. Scan the local ecosystem using NaptuneListings.com and see if all information, especially URL, Name, Address, and Phone Number (UNAP) is accurate throughout. For more information about our hotel website and mobile services or to get a pricing quote, call us at 408-492-9055 or email [email protected]. We’d be more than happy discuss the options and pick the right solution that best fits your hotel’s needs.